“We have been journeying through all the events since 1996. Four Rasyatras, Bhaavyatra, Vyankatesh Jap, Jagannath Utsav, Gayatri Utsav, Avdhoot Chintan Utsav, the foundation of the Dharmachakra, the foundation of Mahishasurmardini at Gurukshetram and the simultaneous Vajramandal Peethpoojan and the subsequent foundation of Trivikram are the events we have experienced through the journey.” Bapu further said, “Prasannotsav is the supreme opportunity to gain the strength needed to make life worth living”. The Varadachandika Prasaannotsava was held from May 8 to May 17, 2011. To increase the number and potential of Shubhankara centres in the body. To activate and lead the inactive centres in the body towards the divine path. To free the bodily centres under the influence of kali, i.e. to decimate the resistance, enemies and intrinsic and extrinsic obstacles that hinder our progress. In the pranamay deha (life force plane of a human body), there are 108 Shakti Kendras (power centres). 45 of these are Shubhankara kendras, 52 are inactive kendras and 11 kendras under the influence of kali. 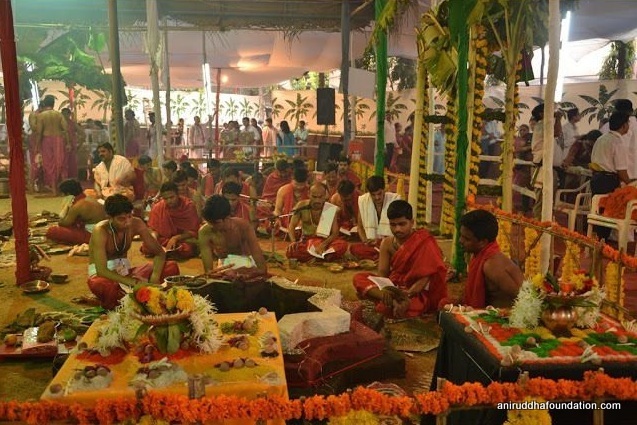 To activate this inactive kendras and release the 11 kendras from the control of Kali was the important task that was accomplished in Shraddhavan’s life through the Prasannotsav. The Granth, Matruvatsalya Vindanam has a recitation of Adimata that gives knowledge, devotion, self-confidence, shield and security, the Granth in fact, is, the ninth incarnation of Mahishasurmardini, named Mantramalini. Mantramalini manifests in the form of ‘Matruvatsalya Vindanam’ of which Prasannotsav was the end result. A few months before the Prasannotsava, willing Shraddhavans was given an opportunity of taking Kanthakoop Pashaan (holy bricks) to their homes to conduct the Shreedevi Poojan. 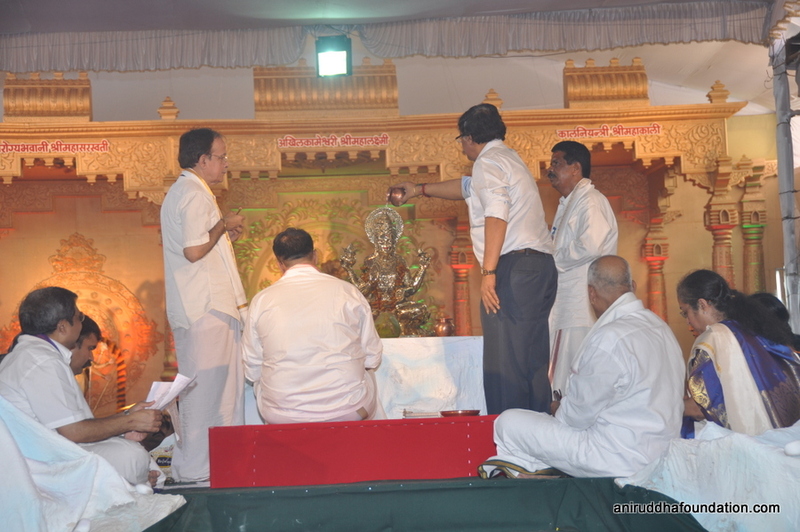 Sadguru Shree Aniruddha did the first poojan of the Kanthakoop Pashan at Shree Harigurugram. Subsequently, thousands of Shraddhavansperformed the Kanthakoop Pashan Poojan at their respective homes enthusiastically with a firm belief that with “Shree Kanthakoop Pashan” they were letting Adimatain their homes. This was marked as the beginning of the Utsav. 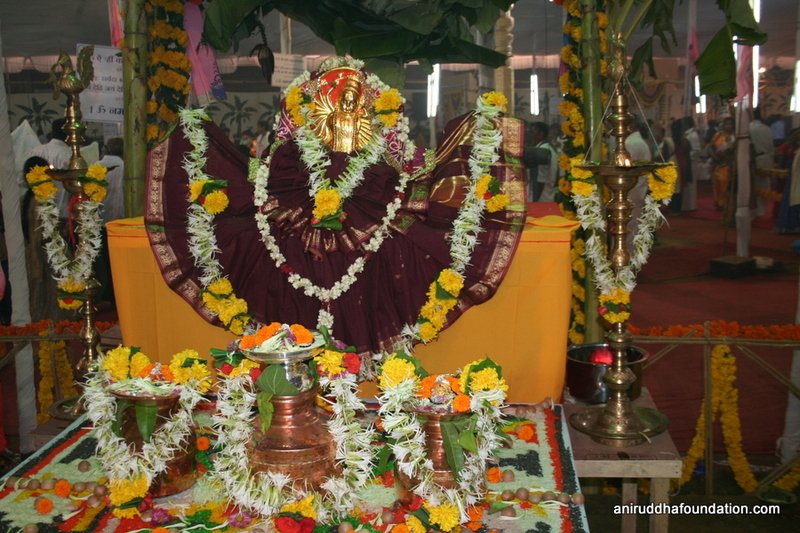 Shree Varadchandika Prasannotsava was very unique, the only one of its kind. Mahishasurmardini’s Akhil Kameshwari (fulfiller of all desires), Mahakali’s “Kalniyantri” (one who has power over the time) and Mahasaraswati’s “Arogyabhavani” (giver of good health) forms were the three primary goddesses worshipped in this Utsav. All these three forms of Chandika were present in the form of idols on the main stage of the Utsav at Shree Harigurugram. Goddess‘Akhil Kameshwari’ stood in the centre, to the right of which was the Goddess ‘Kalniyantrak’ and on the left was the Goddess ‘Arogyabhavani’. The three forms of Mahishasurmardini that wards off all the impediments in the essential elements of Kaal (time), Kaam (desires) and Arogya (health) were worshipped during the Utsav. Every day, there was Mahapoojan and Nityajap (daily chanting) from 7 am to 10 pm. Naivedya was offered three times and Mahabhog was offered once in the evening There would be a variety of Mahabhog through the nine days. Along with the Mahabhog, daily waters from the different rivers were also offeredMaha-Aarti was at 1 pm and 9 pm, daily. Bapu used to himself perform the Maha-Aarti. 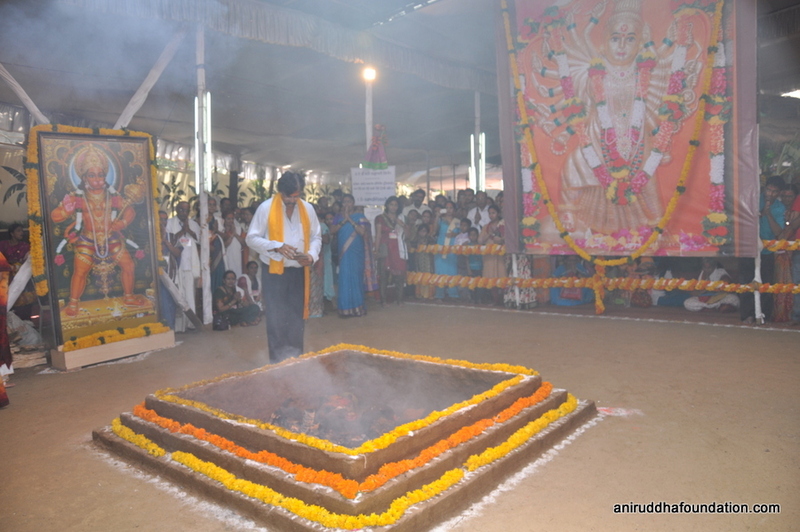 The opportunity to perform the Mahapoojan was also made available to willing Shraddhavans. ‘Sahastra Chandi Yagna was organised before the three primary deities. These three mantras were repeatedly chanted as a set. Moreover, at 2 pm and 8.30 pm, Devi Saptashati was also chanted here. For this yajna, 108 specially trained priests were appointed. ‘Sahastra Chandi Yagna’ was bliss for the Shraddhavans. They were not required to make any offerings here neither were they given anything in return, yet, every Shraddhavan was able to participate, and were also able to see the ‘Sahasrtra Chandi Yagna.This Yagnaaddedstrength and potential to the efforts that were made to attain the grace of Mata Chandika. In ‘Shree Varadchandika Prasannotsava’, a ’Mahakali-Kund’ was built to destroy the kendras, which are under the influence of Kali residing in the pranmay deha (life force plane of a human body). Symbolic representations of the eleven demons killed by Mahakali viz. Madhu, Kaitabh, Mahishasur, Shumbh, Nishumbh, Rakta-beej, Dhoomra-lochan, Asiloma, Chand, Mund and Ravan were put up here. Are those eleven demons who influence the 11 kendras in our body under the influence of Kali. ‘The one who destroys kali is Kaali.’ Shraddhavans offered ‘Asur Dahan dravya’ at the ‘Mahakalikund’. This offering was voluntary but not mandatory. In ‘Shree Varadchandika Prasannotsava’, Bapu had arranged for all the Shraddhavans a special celebration, ‘Mahalakshmi Deep’. In today’s time, it is not feasible for everyone to go on a pilgrimage to 52 Shaktipeeths. 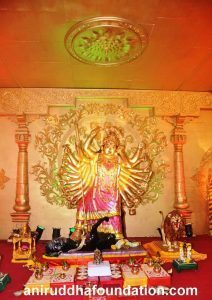 Sadguru Shree Aniruddha had established all the 52 Shaktipeeths in this Mahalakshmi Deep. There were 52 large lamps where Shraddhavans offered ‘Sursneha dravya’. The arrangement for Mahalakshmi Deep was designed with a view to helping Shraddhavans to receive the virtue of the 52 Shaktipeeths. The Mahalakshmi Deep helped convert the inactive kendras into active and potent kendras. Vaapi means a well. The well was constructed using 720 Kanthakoop Pashan which were charged with mantras and holy verses. The poojan was conducted by reciting Sanatan Devisukt, selected prayers from Purusharth Granthraj and an important page from Shree Ramrasayan. 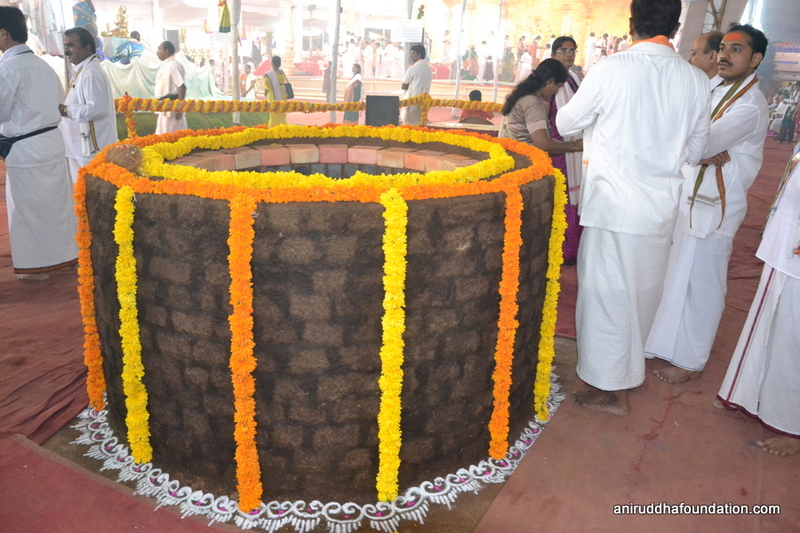 Shraddhavans offered ‘Mangalyadravya’ in this well. Mangalyadravya means Mixture of Haldi (turmeric), Kumkum (Vermilion) and Abeer. After the conclusion of the 10-day festival, the pashans (bricks) will be utilized to construct the innermost sanctum, i.e. 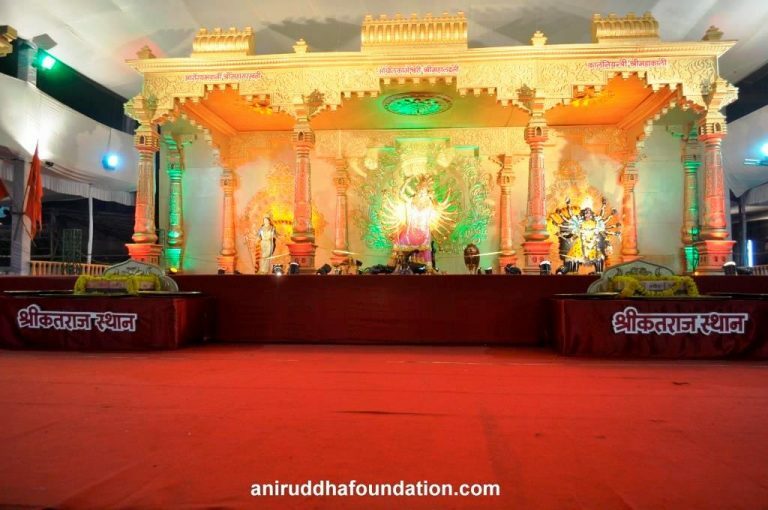 the Chandika Garbhagriha at the first “ ’Purusharth Dham’. 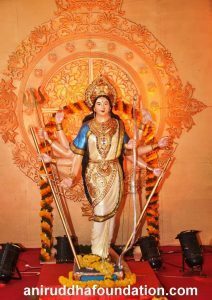 ‘Shatrughneshvari-poojan’ in the Prasannotsava, was the worship of Goddess Mahishaasurmardini’s fourth incarnation, Goddess Raktadantika, that is ‘Shatrughneshwari’, the fiery form. Humans frequently tend to experience enmity in their lives, The fourth incarnation of Goddess Mahishasurmardini, was worshipped to quell such adversaries and their activities. The story of Goddess Raktadantika is mentioned in Matruvatsalya Vindanam An idol of Raktadantika, in her fiery form, was installed in the hall. 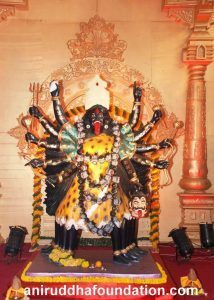 Shraddhavans performed poojan sitting before this idol. The peculiarity of this poojan was that after every batch of poojan, the curtain was raised accompanied by music in the background and Shraddhavan could seek darshan of Raktadantika. The Aarti played with Indian percussion instruments was in fact, out of the ordinary, just like her form. Shraddhavans took her darshan and blessings with love, though the form of the deity appeared very aggressive. 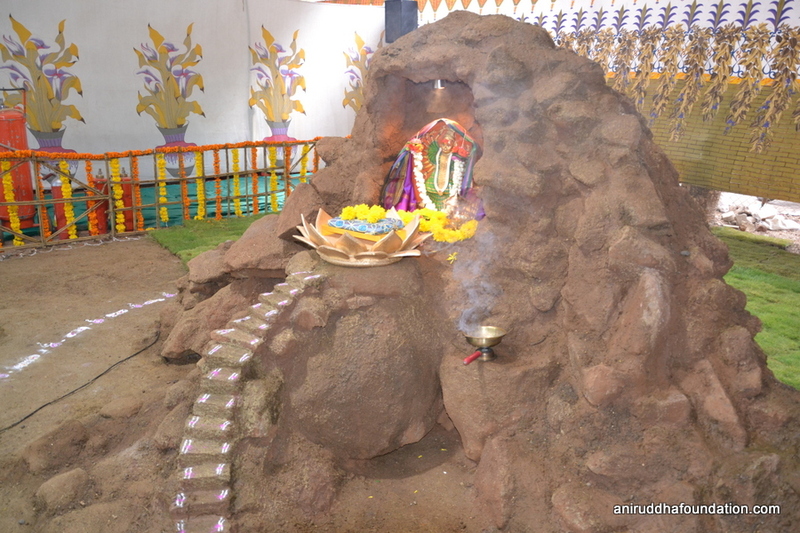 There was another yajna (oblation) in ‘Shree Varadchandika Prasannotsava’ called ‘Shree Durgavarad Hom’. This yajna was performed with an intention to provide strength to simplify the efforts undertaken, to obtain the grace of Mother Chandika. This yajna was conducted according to Atri Samhita and the Sanskrit edition of Matruvatsalya Vindanam. Shraddhavans were able to take darshan of this yajna, which continued for nine days and the concluding part was performed on a ninth day. One of the auspicious days, in the Vaishakh month (a month in Hindu calendar), is ‘Ganga Saptami’, the day when she took rebirth. This was the day when Mother Ganga (the holy river) descended to Earth in the form of Bhagirathi. In 2011, Ganga Saptami was on May 10, which was during the Varadchandika Prasannotsava. Hence, on this day, Parampujya Sadguru Shree Aniruddha established a symbolic form of Ganga. The place where this foundation took place is ‘Janhavisthanam’. At this place, an idol of Mother Ganga, made of five metals – gold, silver, copper, iron and zinc and seated on a crocodile was installed. Continuous Abhishek was performed on the idol amidst incessant chanting of mantras by few Prapathaks who were seated in front of the idol. The accumulated water of the Abhishek was made to flow into a small canal. Every Shraddhavan walking in a queue next to this canal was able to dip his hands in it and was also able to put it’s two drops on his forehead. 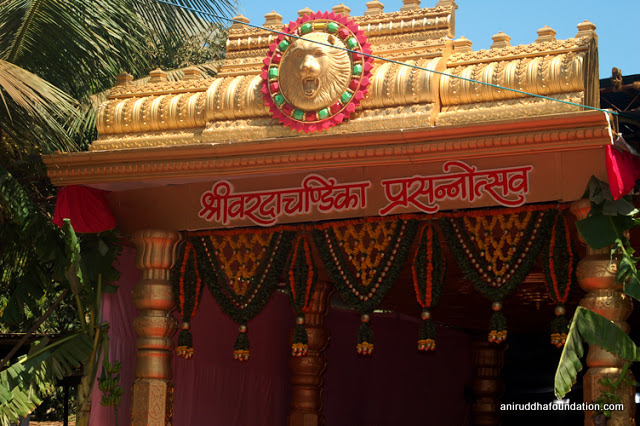 It was through the Shraddhavans that Sadguru Shree Aniruddha accomplished the sacred and arduous task of collecting waters, needed for this Abhishek, from hundred rivers spread all over the world, After the festival, the idol of Mother Ganga (Shivganga Gauri) was installed in ‘Shree Aniruddha Gurukshetram’. 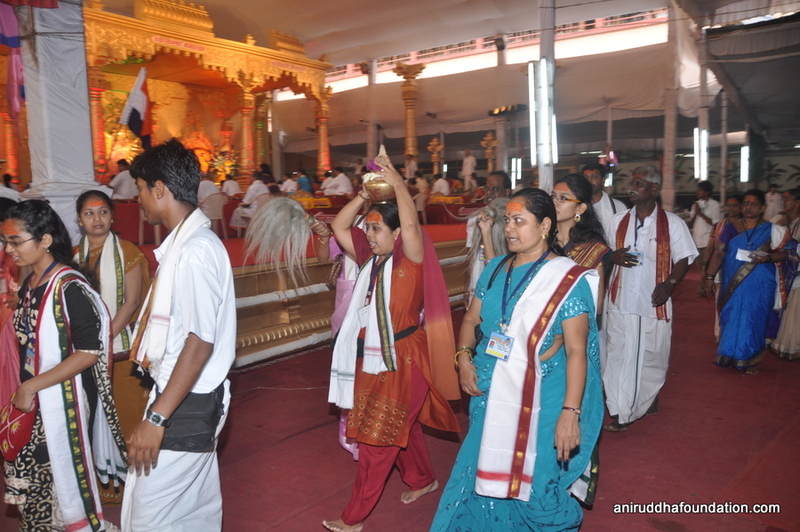 Another highlight of the ‘Shree Varadchandika Prasannotsava’ was the activation (charge) of ‘Avadhut -Kumbh’. Twenty-four kumbhas (pots) made of Panchdhatu (five metals-gold, silver, copper, iron and zinc) were filled with unceasing ‘Udi’ and were charged according to Kalateet Samhita during these ten days. These were also worshipped in a special manner. The 24 Kumbhas(pots) were arranged in a specific formation beside the idols of the three main deities. ‘Shree Varadchandika Prasannotsava’ was indeed a wonderful experience for every Shraddhavan. The Utsav has become an unforgettable event to those who availed themselves of the opportunity to be a part of it. The Utsav that remains forever etched in the memory, enlightening their lives.